So, how do you go about making a "new" low-maintenance garden? First, design your garden with maintenance in mind—good-looking hardscape will both save weeding time and showcase your favorite plants. Second, simplify your garden routines—learn the most efficient planting and maintenance techniques and don't get stressed if everything isn't letter-perfect. Third, learn how to work with nature rather than against it. And finally, embrace home-grown fruits, herbs, and vegetables; well planted containers; and thoughtfully chosen plants. The New Low-Maintenance Garden doesn't just tell you how to garden in a whole new way—it shows you, through profiles and beautiful photographs of real gardens that embody low-maintenance techniques. The pressures of life are not likely to ease up anytime soon, but the lessons of this timely book will help you banish guilt over undone garden chores and revel in your garden successes. Valerie Easton is a weekly garden columnist for Pacific Northwest Magazine of The Seattle Times. 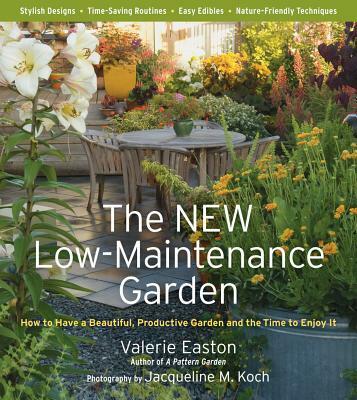 Her own low-maintenance garden, the muse for this book, has been published in The New York Times, This Old House, and Horticulture. She has contributed articles on gardens, homes, and the people who make them to a variety of magazines, including Metropolitan Home, Fine Gardening, and Gardens Illustrated. Valerie trained as a Master Gardener and was for eighteen years the horticultural librarian at the University of Washington in Seattle. She gardens, teaches yoga, and blogs (www.valeaston.com) in the village of Langley, on Whidbey Island, Washington. Her previous book is A Pattern Garden (www.apatterngarden.com). Jacqueline Knox trained at the leeds school of Physiotherapy and has a Postgraduate diploma in Manipulative therapy. She runs her own physiotherapy clinic, lectures on spinal problems and is physiotherapist to the British rowing team who won a gold medal at the Athens olympics. She co-wrote the Official Body Control Pilates Manual and was medical consultant on the book Pilates Pregnancy Guide. Photographer and journalist Jacqueline M. Koch’s assignments have taken her from the Pacific Northwest to the South Pacific, Africa, and Europe. Her portfolio includes gardens and landscape design as well as coverage of world events, and her work has appeared in Pacific Northwest Magazine of The Seattle Times as well as in Garden Design, Time, Newsweek, and The Washington Post. She is also creating a low-maintenance garden of her own for her new home. Her Web site is www.jmkoch.com.